KromeKaiju3000 reviews the Toho Large Monster Series King Ghidorah 1968 North American Reissue (Bluefin) vinyl figure by X-Plus. YouTuber ぎわちん。 reviews the Toho Large Monster Series King Ghidorah 2001 RIC Exclusive vinyl figure site by X-Plus. This RIC version came with glitter paint apps. The Large Monster Series King Ghidorah 1968 is back and in a new flying pose. Read on for more details, photos and commentary. The Toho Large Monster Series King Ghidorah 2001 vinyl figure by X-Plus has a fantastic, movie-accurate sculpt, a dazzling spread of seemingly individually sculpted scales, an insanely awesome paint job (which you really do need to see in person to fully appreciate) and an amazing “presence” on the shelf. Check out this review packed with new photos and see why I think it’s one of the best X-Plus figures of 2017. 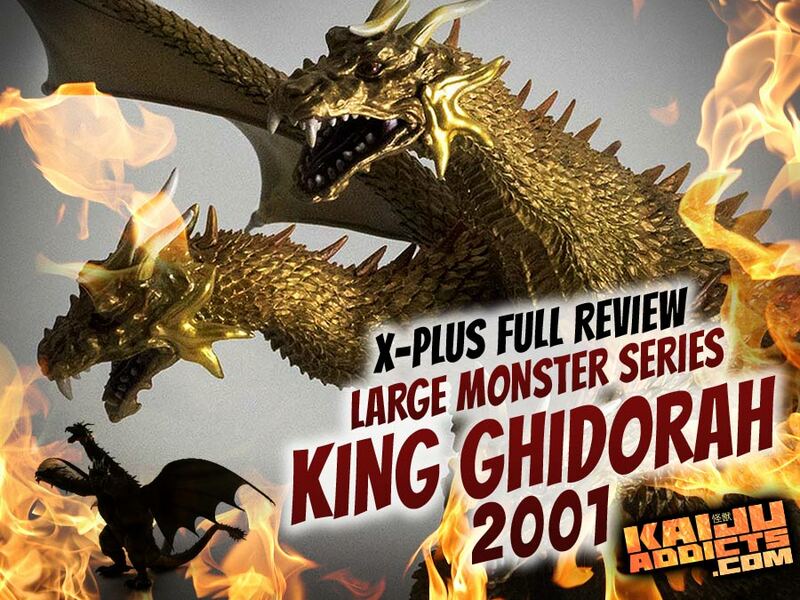 SuperGodzilla1974 reviews the Toho Large Monster Series King Ghidorah 1968 vinyl figure by X-Plus. • See more videos at the SuperGodzilla1974 YouTube Channel. 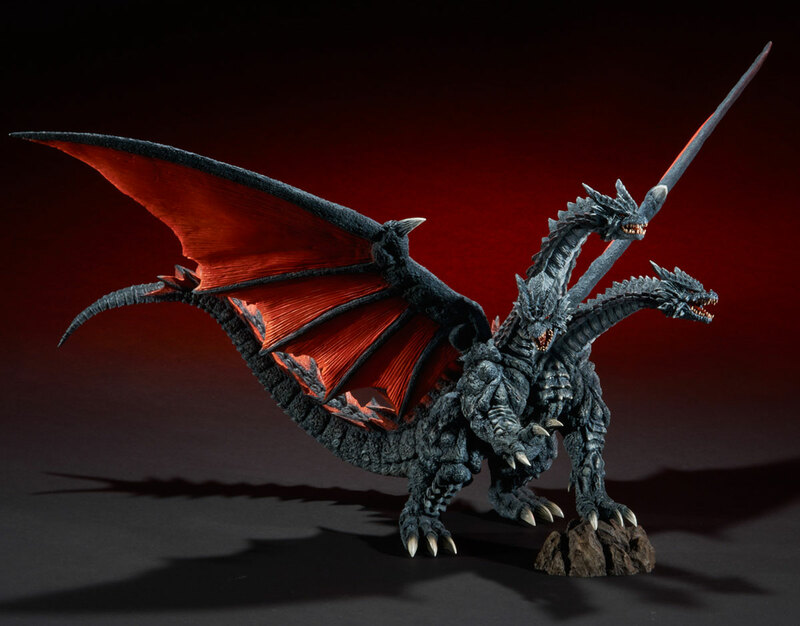 Now up for pre-order: the Large Monster Series Death Ghidorah vinyl figure by X-Plus. This big, bad guy appeared in the first installment of the Rebirth of Mothra trilogy in 1996. It was introduced a couple of months ago at Super Festival 75 in Japan. 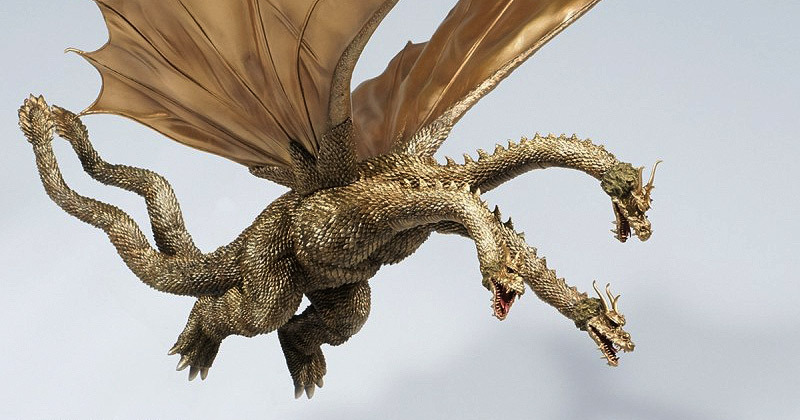 GodzillaFanFreaks reviews the Toho Large Monster Series King Ghidorah 2001 (東宝大怪獣シリーズ 「キングギドラ（2001年版）」) vinyl figure by X-Plus. • See more video reviews at the GodzillaFanFreaks YouTube Channel. Rich Eso reviews the Toho Large Monster Series Keizer Ghidorah (東宝大怪獣シリーズ 「カイザーギドラ」) (standard version) vinyl figure by X-Plus. This is Monster X’s ultimate form in 2004’s Godzilla: Final Wars. Rich also provides a size comparison with the recently released Toho Large Monster Series Godzilla 2004. Rich Eso reviews the Toho Large Monster Series King Ghidorah 2001 Standard Version vinyl figure by X-Plus. Episode 3 of Kaiju Addicts TV is now available. In this episode, I review recent X-Plus releases in Japan and North America. We learn about upcoming releases including a Toho 30cm Series Godzilla 1995, Large Monster Series Titanosaurus and Keizer Ghidorah. We were also recently teased with a Large Monster Series Gabara and GMK King Ghidorah. We discuss the problems with the Large Monster Series King Ghidorah 1968‘s packaging from the original release and look at why the new box is so much better. Also, we’ll take a look at a surprising sculpt modification on the North American reissue of the 30cm Series Godzilla 1984 which now stands taller. And a quick guest review of the Gigantic Series Yuji Sakai Godzilla 1999 by Leslie Chambers. Finally, we take a quick look at some fantastic toy photography featuring X-Plus, by collector, John Ruffin from his site, MyKaiju Godzilla. William Fett, continues his new X-Plus Youtube series with an Unboxing and Review of the Toho Large Monster Series King Ghidorah (Bluefin North American Reissue) vinyl figure. He makes a point to address the new packaging which, hopefully, will correct all of the breakage issues which the original Japanese release suffered. See X-Plus videos at more at The Godzilla Files on Youtube.